Vinyl sees a revival at Amazon | What Hi-Fi? 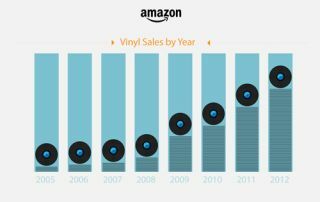 In something of a surprise considering the apparent dominance of digital music, vinyl has seen a revival over at Amazon.co.uk with sales up by more than a 100% than the same period last year. Growing steadily since 2006, the format's biggest seller at the e-store this year has been Daft Punk's Random Access Memories. Not only does it hold the top place in the chart for 2013, it's also the storefront's biggest overall seller since Amazon.co.uk launched their Music Store in 1999. Other entries in the top twenty vinyl bestsellers include Adele's 21 (placed at no. 2), David Bowie's The Rise and Fall of Ziggy Stardust & the Spiders from Mars (no.6) and Radiohead's Ok Computer (no.14). More nuggets of information shine a light on customer purchasing decisions. Rock music is by far the most popular genre, accounting for 55% of sales. The genre also contributes the most in terms of singers/acts for the bestselling albums of 2013. In terms of sales around the country (in the last decade), Adele's 21 assumes pole position in the Midlands, the South and the East. Daft Punk's latest album takes the top spot in more than half a dozen regions including London, the South West, Lancashire, Northern Ireland, the North West and Northern Scotland regions. In a press release sent out by Amazon, the online retailer said it anticipated that sales would continue, "especially in light of the recent launch of Amazon AutoRip". AutoRip is a service which allows customers who have purchased physical copies of albums access to a digital, MP3 version at no extra cost. Xavier Garambois, Vice-President, European Consumer Business at Amazon EU S.à r.l said, “vinyl has traditionally been the music enthusiast’s format of choice. It’s great to see so many people rediscovering a format that holds such an important place in music history."